A Homeless Father Is On The Street With His Daughter. How New Yorkers Treated them? I'm FURIOUS! Homeless Father Vs. Homeless Drug Addict Social Experiment. Which one do YOU think New Yorkers more likely to give to? 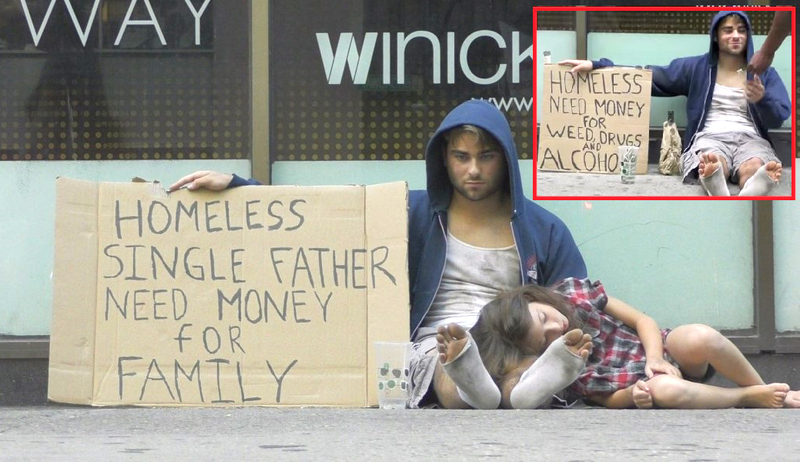 A man asking money for his family or a homeless drug addict asking money for drugs and alcochol? The results were actually very surprising. Passersby often gave their money freely to the drug addict with the seemingly funnier and outrageous sign. But when I saw what New Yorkers would do when a homeless single father and his sick daughter needed help…my heart broke. Many people walked by, without a care in the world. Even as his daughter coughed, people read the sign and just carried on about their day. Just when I thought that all faith was lost, a woman approached and did something that restored my faith in humanity. There are still good people out there, but it’s an important message to spread that we should give to those who truly need it, and not wait for someone else to do what we should have done as proper human beings. Please SHARE this video with family and friends. Everyone should see this.